Description: Stanton Station Road, 1127 hours. Description: NS 93M leaving Enola Yard. 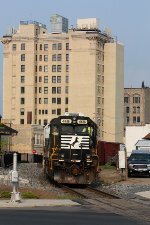 Description: Union Pacific in Hazleton. Description: 33A rolls into Allentown under heavy snow conditions. Description: Main Street, 0905 hours. Description: A rare Saturday morning sighting of NS H75 coming down the Cement Secondary track in Bethlehem with a former Conrail unit in consist. Description: Coming off the ex-CNJ Delaware River bridge to switch onto the Washington Secondary. Description: With guidance from his conductor, NS local H74 backs against its train on track 3 in River Yard...."half a car, 4616, half a car"
Description: H76 crosses through C.P. 88 at 1059, with an increasingly rare SD40-2 in her Conrail colors and a somewhat uncommon GP59 behind. Description: C.P. 88 at 1059. Description: NS GP59 4616 is the third unit on. Description: H76 slowly moves east into River Yard.